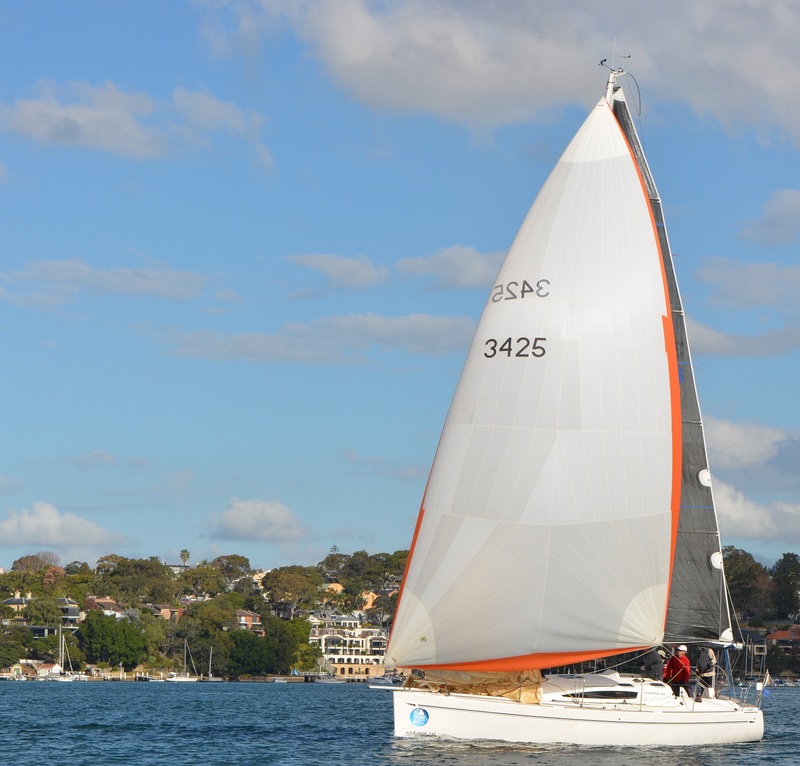 There are a number of items on this web site where we express the privilege that sailors enjoy in Sydney, that privilege is the ability to sail all year round. Today’s West Harbour Winter Series race was no exception, held in winds that ranged south to south westerly, about 5 to 11 knots, right in G-whizz’s sweet spot. With temperatures closing in on 20 degrees centigrade only the cooling southerly took the edge off another perfect day on Sydney Harbour. While we were well positioned for the start, we were a little bit early. We were not alone, a number of boats leeward to us were in the same predicament, I was waiting to be pushed above the committee boat, and after getting to the line about 20 seconds early I was waiting to be pushed over the line, however it seemed as if we had some sort of force field around us, we were at the absolute bottom of the give way boat pecking order, but were given plenty of room to run down the line before hardening up on the start signal. The subsequent great start was more good luck than good management, but I’ll take that any day. In the light winds we were able to stay with the sports boats on the work towards the Balmain shore, it wasn’t until the down hill run after the Schnapper Island mark that a slow, but uneventful spinnaker hoist meant that we lost a bit to the faster of the sports boats. The crew did a great job running the boat, with most spinnaker hoists and drops going smoothly, the only issue we did encounter was when the lightweight number one genoa jammed on a hoist. This has been an on-going issue that we seem only to avoid with judisciuos placement of two sail pre feeders. I forgot to tell Colin this, but the first instance of this problem was the only time it happened. On the last run from the Spectacle Island mark to the Woolwich Dock mark the wind was backing and veering between 85 and 140 degees off the starboard bow at about 7 knots, we gambled on staying with the assymetric spinnaker. It was bit of an unnerving feeling to be the only boat in the race at that point to be flying a spinnaker, but we were also the fastest boat, it was also intersting to watch the reaction of some the crews in a group of about 8 boats (satisfyingly for me the group included some assymetrical equpped spots boats), as they scrambled to hoist spinnakers as the wind veered towards the south west, after we had sailed through them. At the Woolwich dock mark, the last before the finish, we got caught in a group of division 3 an 4 boats, I thought it prudent not to fight for mark position and sail around the outside of them, a pretty good decision as the rounding was bit of a melee, unfortunately this also meant we were leewaed of a number of them and had to wait a long time to get into a position where we could tack and pick up the wind shift that would take us to the finish. A satisfying result on another beautiful winter’s day on Sydney Harbour, we are privileged!